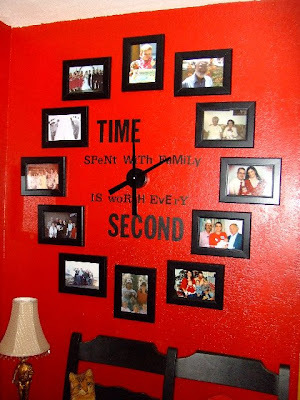 I have had about two dozen emails asking about how to make this photo frame clock. Nancy emailed me a picture of her clock after I posted an idea about wanting to use family photos to create a clock based on this framed scrapbook paper clock over on decor8. Because a lot of the questions come from comments that don't have email addresses attached to them, I thought I would give you what info I have. You should be able to buy clock hands at your local craft store or on Ebay. If you just buy the hands and the motor you are going to have to make a mount for them that can hang on the wall. 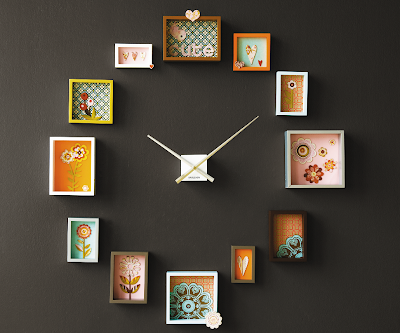 The easiest thing is to buy an inexpensive modern clock that is just hands that will already come with a mount. (Like these clock from Amazon). Other than that is is just random frames that you buy or have around your house! If you do end up making one, I would love to see it! You can get the hands and movement at Clock Parts. You need to click on "movements" on the left side of the home page then on to high torque movements. NOT the German movements. They are different. There is a phone # you can call if you have questions. The letters can be found at Michael's. My friend made up the sentiment and you may feel free to use it! This can be done with any size frames but mine happen to be 5x7. I was lucky enough to find them all at once for 89 cents each at a thrift store. I used one person in one o'clock, two people in two o'clock, three people in three o'clock, etc. We didn't have a pic with 10 people so those are my granddaughter's toes at birth and 12 is my other granddaughter with her dozen Easter eggs. Have fun! I get HUGE compliments on this all the time. WOW! What a pleasant surprise! I'm Nancy. That's my photo clock. You can get the hands and movement here http://cart.clockparts.com/index.php You need to click on "movements" on the left side of the home page then on to high torque movements. NOT the German movements. They are different. There is a phone # you can call if you have questions. The letters can be found at Michael's. My friend made up the sentiment and you may feel free to use it! This can be done with any size frames but mine happen to be 5x7. I was lucky enough to find them all at once for 89 cents each at a thrift store. I used one person in one o'clock, two people in two o'clock, three people in three o'clock, etc. We didn't have a pic with 10 people so those are my grandaughter's toes at birth and 12 is my other grandaughter with her dozen Easter eggs. Have fun! I get HUGE compliments on this all the time. Thanks for featuring me again. I'm sending links to all my friends! Your blog is one of the first things I look at every morning. OMG!! I nearly fell out of my chair when I saw this. I love, love LOVE this!! I made a clock like this a few years ago, I'll have to send you the picture. I absolutely love it! Nancy!!!!!! I am so glad you commented!! I couldn't find your original email and your click has become VERY popular on pinterest!! Thanks for all of the information!! I will update my post with your info!!! Yay!!! I am glad you saw this! I couldn't find your original email!! Awesome idea! I love it! Now, to come up with wall space!! Can you show me how to get to my clock on pinterest? I searched "clock" there and only found pix of the other clock in your post with the white frames and the scrapbooking paper. Nancy just search for the Phrase. That is how I found it. Its amazing, can't wait to make it. what size hands did you use for your 5x7 frames?